How to pump the biceps in the gym and at home? 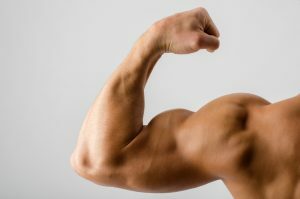 In the environment of bodybuilders, biceps is very popular. It was for them that a lot of basic, isolating and other special exercises were invented, although with proper pumping triceps have a much larger volume. But the fact remains that the two-headed muscles of the hands are more popular. What do you think, why did such an opinion form such a stereotype? So, as you already understood from the title of the article, the biceps of the hands can be pumped as in a specially designated place for it, where there are a lot of simulators and shells, as well as houses where one or two shells, or even improvised tools, can be used. Let’s start with the gym. Any normal gym should provide its customers with at least a minimum of equipment: a bar with pancakes and dumbbells. I’m not talking about the Scotch bench, special block simulators and the EZ-neck. If in the hall in which you are engaged, there is all or most of the above, then I congratulate you – with diligent work you will get bulky biceps and triceps. Two-headed muscles of the hands can be pumped with accentuated exercises on them, and also together with the pumping of the back: during rod pulling in the slope, pulling up on the bar, pulling the upper and lower blocks. And in general, any exercises for the development of the widest muscles of the back can stimulate their biceps to growth – they work “in pairs.” Do you know all the secrets of bicep growth ? But be prepared that sooner or later such exercises will be missed – you still have to use basic ones. As you already understood, at home, you can also work with dumbbells and use the above exercises in front of the mirror. Also pumping biceps at home involves pulling up on the bar with a back grip, on one hand or with a turn of the wrist. A convenient simulator for biceps can be a rubber expander – it, like dumbbells, takes up little space. If you have a boom at your disposal, you are lucky. If there is not a single projectile, but want to look pumped up – it does not matter! Can you find five or six liter plastic containers? Fill them with water, or even better with sand, and do your health, performing various flexing / stretching of hands standing. Gol on the fiction is cunning, so dare. Well, well, let’s go directly to the exercises. Flexion of hands with the bar standing – take a straight neck, press the elbows against the body, perform bending of the hands in the elbows, bringing the bar almost to the shoulders, lower it. That’s the whole exercise. The same is done with the EZ-neck (or as it is called in the common people – a crooked stamp). Different widths of grip can affect the outer and inner side of the biceps. 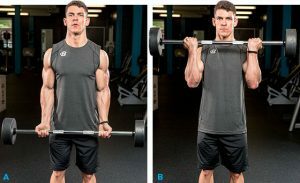 Alternating bending of hands with dumbbells with a twist of brushes – take two dumbbells in each hand, hands freely lowered along the body. With your right hand, make a bend in the elbow and turn with a brush (palm to you), bringing the dumbbell almost to the shoulder. While lowering the bent hand, do the same for the opposite. That is, when one hand is lowered, the other rises. Therefore, the exercise is called alternate, not alternating. Does it feel the difference? “Hammer” – the starting position is the same as in the previous exercise (dumbbells are freely lowered at the sides, palms look at you). But now do not need to rotate with brushes, look at each other. Perform alternate bending of the hands in the elbow joints with a clear fixation of the hands. At the time of exercise, you will get the impression that you are working with two hammers. Concentrated bending on the biceps – it is necessary to sit on a bench or other convenient place, but that the feet stand on the floor. Take one dumbbell in the right arm, and place the elbow on the side of the hip, resting on it with the lower part of the triceps. Perform lifting and lowering the dumbbell. Bench of Scotts – take a straight, curved bar or dumbbell, sit down on the bench, placing her hands on it. Perform flexion and extension of the arms in the elbow joints. This simulator is designed to remove the load from the waist and transmit it to the biceps. In principle, like the previous exercise. The first three exercises can be attributed to the basic, the last two – to the insulating. Personally, I advise you to use the base in the initial stages, and isolating and special – only after the acquisition of semi-annual experience. Special exercises include bending of hands in a block simulator, where the handle is located at the level of the knees. Also, the exercise with a rubber expander can also be attributed to special ones. What exercises will you choose? For the home, the exercises borrowed from the hall are also suitable. If you have a barbell at least dumbbells, then you can not embarrass yourself in choosing exercises. But let’s start from the worst option – there are no sports equipment at all. As mentioned above, we take containers filled with sand or water, and start working. Flexion-extension of hands – take the containers by the handles and start bending your arms in the elbows, bringing your palms almost to the deltoid muscles (shoulders). Lower. It’s easy, right? Concentrated bending of hands – to take in one hand a container, placing the hands themselves, as described in the exercise “concentrated biceps flexion”. Perform the same exercise. And in general, if you do not have the opportunity to buy collapsible dumbbells, then fork out for an expander, I still advise you – a useful thing, and do not look for a capacity to exercise for the biceps at home.